One of the things that has truly surprised me during our time in London and in our readings over the summer was the lack of a widespread religious sentiment and a growing secular way of thinking. Visiting the different places of worship for me has been very enriching. I sincerely enjoyed hearing about the way different roles of various institutions in their communities. Despite this growing secular sentiment, it was evident to me that faith is still an important key to Englishness. Sure, we may not have had the same treatment at the Christian institutions we visited, but we weren’t at the parish church where they would have stressed the other parts of Christianity outside of the famous dead people. At the mandir, mosque, and synagogue, I did learn something about other faith communities, all of which I wasn’t that familiar with. Familiar with Christian outreach, it was interesting to hear the way other faiths volunteer and conduct outreach. I was also intrigued by the amount of history each guide mentioned; at the mandir, there was a specific exhibit to help you understand the history and beliefs of Hinduism. At the mosque, the guide spent more time on the basic principles, whereas at the synagogue it was much more history heavy, which I enjoyed (despite the slight mix up with who declared the crusades and who ordered Richard’s). Yet, they all stressed the importance of the community and what they did for the community. At the end of each tour, I felt that I had been where a faith was active and thriving- counteracting the general arguments we had encountered. Before I talk about my favorite experience, I’m going to go off on a bit of rant/tangent. (Nothing unusual, you’re probably thinking.) While Christianity is undeniably not as much on the forefront as it once was (I sometimes forget I’m not in the Middle Ages where the church was as influential as those in political power and grotesques littered the cathedral for unknown reasons), it is still playing an important role in England. How? Most noticeably, the concerts we’ve attended. Sure, they haven’t been lectures in Christianity, but they have brought people into a church where they were witnessing a faith community. You don’t necessarily have to have a lecture about the religion’s history when you are there in order to spark an interest. Sometimes a few trips for concerts or to be a tourist will spark an interest and prompt someone to ask a question that leads to a serious discussion. Yes, it would have been nice to have left any of the churches/cathedrals with a pamphlet on basic Christianity, but because those audiences (presumably) weren’t there to learn about Christianity, a pamphlet may have been more alienating than encouraging. Okay, so my favorite experience and what it taught me. 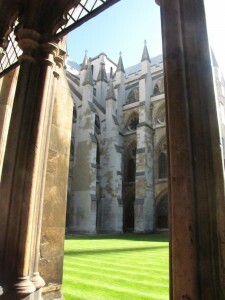 Hands down, my favorite has been (no surprises) Westminster Abbey. (This may change as I’m hoping to get over to St. Bartholomew the Great tomorrow; it’s a medieval parish church.) Why when it didn’t actually teach me about Christianity or the abbey that I didn’t know? One, because it inspired my faith through the sweeping architecture and stained glass. For me, those are more impressive and awe-inspiring than St. Paul’s (in its present Wren-wrecked – okay, so maybe that’s a bit harsh-state) could ever dare to be. Two, because as a medievalist, I was able to participate in a long-standing tradition: the pilgrimage. Throughout history, people have visited sites throughout the world for many reasons. At Westminster Abbey, everything I love was combined into one place: my faith, grotesques, cosmati, saints, Chaucer, Gothic architecture, etc. I was on a pilgrimage of sorts. True I wasn’t there to pay my respects to Edward per se, but I can’t deny seeing the tomb of such an important figure didn’t give me chills (even though it’s been really messed up and reassembled incorrectly). I didn’t necessarily have to learn anything about Christianity to have an incredible experience. Yet, to say I didn’t learn anything is mistaken. I did, but I learned more about the position of the Church of England. It is clearly in decline, but the abbey is doing what it can given its monumental dual-purpose (protect priceless art and architecture while spreading its Christian message). I’m sure some of us would argue that it is up to these major institutions to take the lead in revitalizing Anglicanism, and to some extent Christianity, in England. However, because Westminster Abbey stands for so much more than just Christianity (whether this is a good or bad thing is up for debate), it is important for some of the parish churches to be more vocal on these issues. For Westminster Abbey (and to some extent St. Paul’s) to take a major stand is a conflict of interests, a problem that lays at the heart of its problems rises: should it risk alienating the audience that helps it survive in order to promote its beliefs? It shouldn’t compromise its faith (and I don’t think it does; it does remain closed for services on Sundays as well as hosts small prayers and services throughout the day/week) in order to protect its architecture, nor should it compromise its architecture to protect its faith. They go hand-in-hand in many regards. Without either, you lose part of the abbey. If there was ever a lose-lose, impossible to win situation, double-edged sword, etc, this was it! 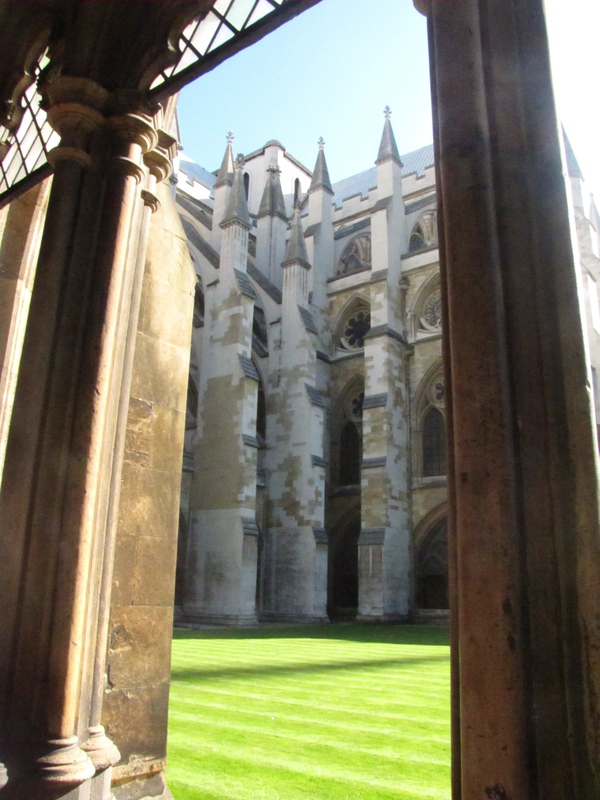 I’m hoping as I visit other major medieval cathedrals, a solution to the Christianity vs. tourism problem will become evident, but for now Westminster Abbey will have to be simply (as its Cloister represented for its medieval monks) my paradise on earth.